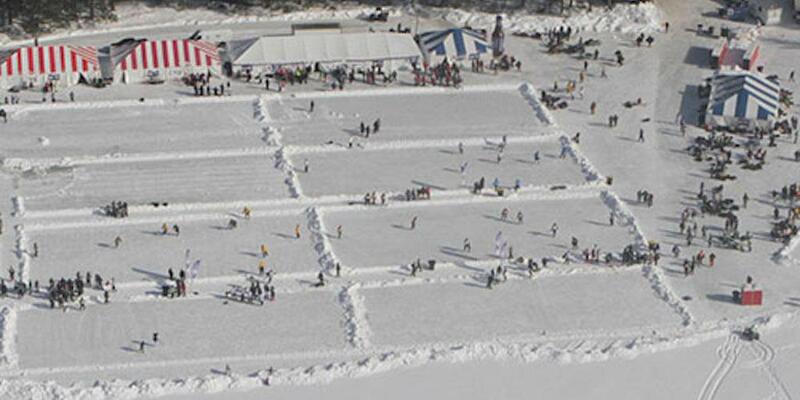 EAGLE RIVER, Wis. — With 280 teams competing at the 2019 Labatt Blue/USA Hockey Pond Hockey Championships, there are almost as many stories as there are teams carving up the ice at Dollar Lake. Over the course of the next three days, USA Hockey will attempt to share some of their stories. 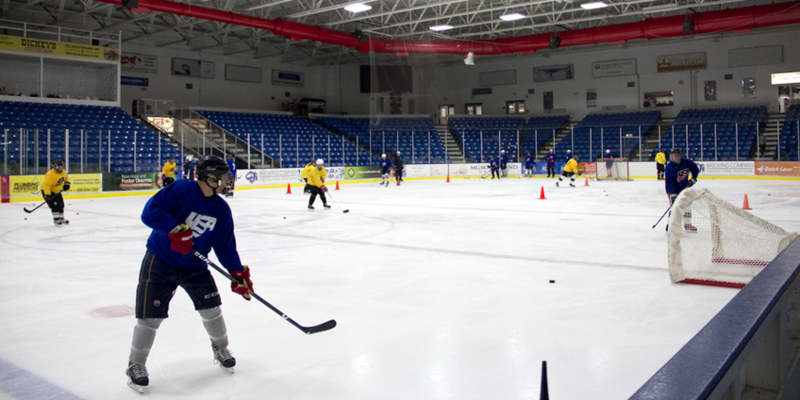 Now it its 14th year, the event has become one of the most popular on the hockey calendar as teams from as far away as Upstate New York and San Jose, Calif., coming to the northwoods of Wisconsin. Some teams have been here from the beginning, others are skating on outdoor ice for the first time. For both veterans and newcomers alike, it's an experience they'll never forget. There's something to be said for experience. Dave Cavanaugh has been coming to the Labatt Blue/USA Hockey Pond Hockey Championships since the inaugural year in 2006, and one look at the little compound he's constructed on the edge of Dollar Lake will tell you that he has learned a thing or two along the way. Cavanaugh and his friends from several other teams, including the Beer Ninjas and Midlife Crisis, bring their own warming tents, lawn chairs and grills to the party, and dish up a variety of great food, including burgers, brats and barbecue to be enjoyed before and after their games. You can say that Cavanaugh takes his show on the road. He is the owner of the Light The Lamp Brewery, a popular hockey-themed establishment in Grayslake, Ill., not far from the Wisconsin border. His Light The Lamp team got off to a good start in the 40 & Over Tier I division with an 8-7 win over the High Lifers. From his perch on the frozen water's edge, Cavanaugh has a front row seat when it comes to seeing how far the event has come over the years. 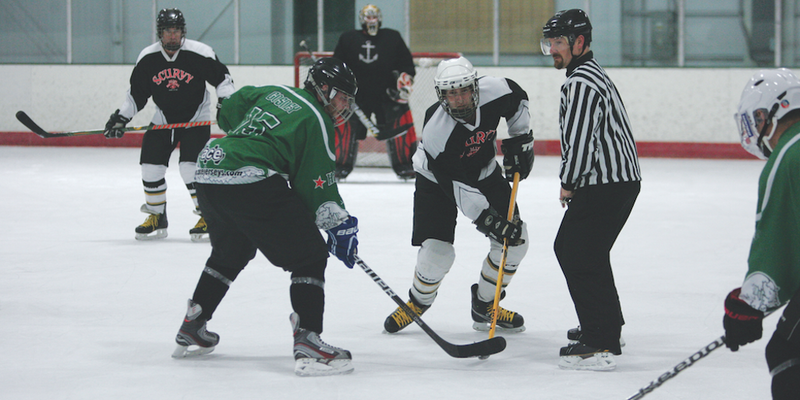 "When this all started there were about 20 teams playing on six rinks our here. And now it's escalated to this," he said with a sweeping gesture at all the games taking place off in the distance. There is no shortage of colorful team jerseys and even more colorful team names — some of which can't be mentioned here — competing at this year's tournament. One of the most colorful is the team calling itself Trinidad & Tobago. Decked out in tie-dyed uniforms, the team is hoping to play as good as they look while competing in the Intermediate 30 division. Unfortunately they got off to a bit of a rough start with a 13-5 loss to Placek and the Heartbreakers. That won't stop this group from the Chicago suburbs from enjoying their time in Eagle River. "We're all super handsome guys, especially when we're wearing tie-dye," said team captain Mike Kites. The team has been together for about 10 years, first coming together at the University of Illinois roller hockey team. They take their name from the Mighty Ducks movie, where the Ducks faced off against a fictional team from Trinidad & Tobago in the Junior Goodwill Games. The guys have been wearing the jerseys for the past three years, including during league play at Johnny's Ice House. "We're all really good friends and love playing together," Kites said. "And as you can tell from looking at these jerseys we look good doing it." When you have teammates with nicknames like Sparkles and Glitter it's good to dress the part. For members of the Unicorns women's team that means wearing frills and lace on their uniforms, along with unicorn horns taped to their helmets. It's all part of the fun for the team from San Jose, Calif., who are competing for the third time here. Every year they learn a little more about how to deal with the elements, and how to keep their costumes from getting in the way of their play. "You don't even notice it," said Marie Farina. "We use a lot of Velcro and hockey tape to keep things from falling off. Hockey tape works on everything." Even though the temperatures on opening day barely hovered above 0, these women from Northern California took it all in stride as they won a close game, 7-6, against Huh?, in the Women's Beginner division. "We would like it to be about 10 degrees warmer, but it is what it is," said April Umek. "This is what we signed up for."